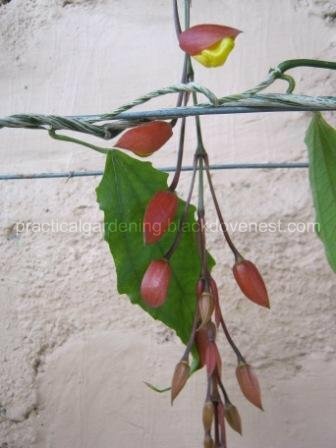 After seeing the first raceme of our Thunbergia Mysorensis (Mysore Clock vine), I was anxious, yet excited as to how the cluster of flowers would develop. Of course, I've seen images of this vine acclaimed as the prettiest flowering vine in the world in the book "Vines of the World". I've seen the actual spectacular racemes from a road trip and how everyone in that trip were awed at the beauty of these flowers. Immediately, you'd note the young greenish buds near the bottom of raceme which don't give a clue as to how the flowers would look like. 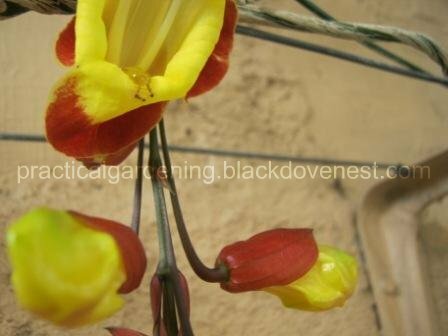 The racemes of the Thunbergia Mysorensis grow downwards. Flowering is descending, meaning, the flowers at the base (which is actually at the top in the photo), are the first to develop. The photo below shows just that. You'll notice the red-brown bracts open up and ultimately become the sepals of the flower. The flower is yellow and as shown below (photo taken 5 days later) is still closed and is just coming out from the red-brown bracts. It is rather mysterious how a balloon-looking flower would develop and open up into the famed flower often referred to as Lady's Slipper or Doll Shoes. 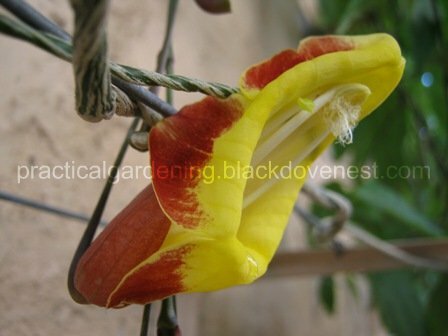 I've often wondered why the Thunbergia Mysorensis flower has these monickers. Articles found on the internet don't explain why. But after I've seen the first flower to completely bloom, I now know the reason why it's called Lady's Slipper. Shown below is a photo of the raceme taken 10 days later. Focus on the fully developed yellow and red flower you see at the top of the picture. Now tilt your head to the left. You'll spot the Lady's Slipper with the slipper pointing down and seems to have these red ruffles on the instep and sides. Not convinced? Shown below is a close-up view of the flower taken from the opposite side. Tilt your head to the right this time. Now, do you see the Lady's Slipper? I read somewhere that these flowers had dripping nectar and that you'd better not walk under them lest you'd find sticky nectar on your skin. I thought that was an exaggeration, until I saw so many ants. Yes, there was nectar dripping from the opening of the first flower. Here's the raceme's first flower with dripping nectar from its throat. Look closely at the picture above. You could even spot three ants feeding on the nectar. 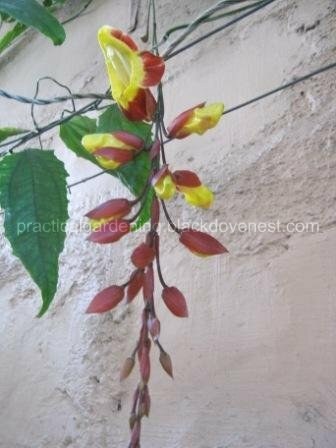 That's how the book "Vines of the World" has considered this beautiful flowering vine. 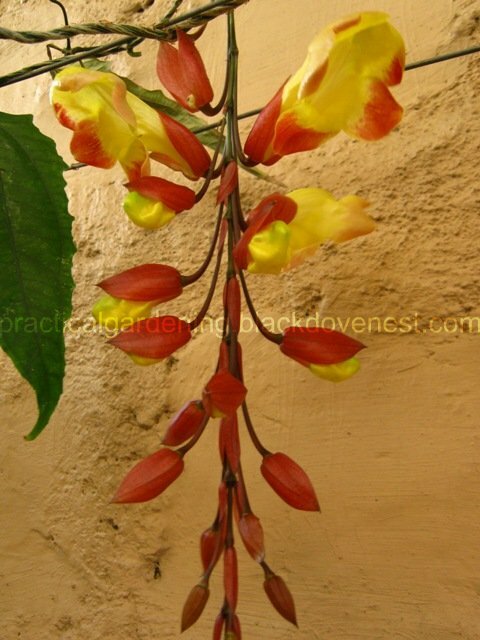 The photo below shows a chandelier-like appearance of the raceme. At this latter stage (photo taken 2 days later) not all of the flowers of the raceme have developed, and the first bloomed flower has fallen off. 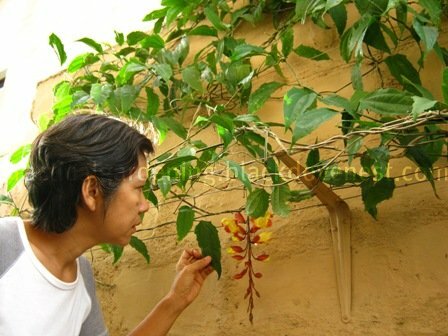 Just to show the size-reference of the Thunbergia Mysorensis flower, here's DH proudly showing off our vine's first flower cluster. 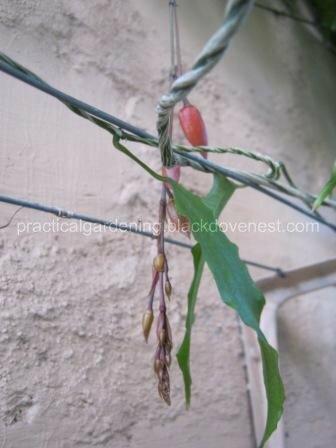 Yes, the hanging raceme looks small. I believe though that this is a small raceme and others can grow much bigger and with more flowers. If you've seen these vines in big garden conservatories and in their natural habitat, you'd be amazed how big these racemes can get. The biggest I found so far was two feet long. Hi i hope you are doing well. Please tell me how is your vine doing. As i have several mysore vines in one of central americas most tropical cities. I hope yours bloomed fully in the lowlands. Cant wait your answer! Hello Oscar. The vine gave flowers, but it was not as much as I hoped. Maybe it needed to become more mature to be a prolific bloomer. Thanx for dropping by!